Within the Shambhala Community, many of us are familiar with terma that the Vidyadhara Chögyam Trungpa Rinpoche discovered after leaving Tibet, such as The Sadhana of Mahamudra and a number of Shambhala texts. However, until recently we knew nothing of his activity as a tertön (treasure revealer) while still in Tibet. Some time after the Vidyadhara left Tibet, his nephew Karma Senge Rinpoche collected all of the Vidyadhara’s terma that he could find, over a period of fifteen years. 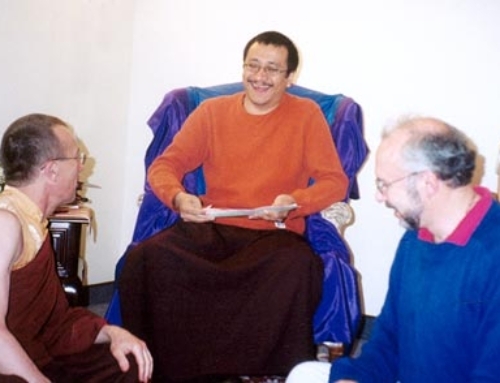 On his first trip to the West in July of 2003, Karma Senge Rinpoche spoke about some of the terma the Vidyadhara discovered in Tibet. The following account is excerpted from a teaching he gave at Shambhala Mountain Center, translated by Sarah Harding. The Collected Tibetan Works (sungbum) of Chögyam Trungpa Rinpoche includes three kinds of terma: mind treasure, earth treasure, and pure vision. It also contains a “terma address book” for his various terma. An address book is like a table of contents but more, indicating where a particular terma will be found, the circumstances of finding it, how its teachings will be propagated, and so on. The Vidyadhara’s terma address book lists some of his previous incarnations, such as Dombi Heruka in India, Vasudhara in Nepal, and Nyak Jnanakumara in Tibet. The latter was one of Padmakara’s disciples, who received the eight logos practice of Amrita Quality. The book also details the garland of births of the Trungpa tülkus. The Vidyadhara’s tertön name is Trakthung Rigdzin Tsalchang (“Heruka Vidyadhara Holder of Power”). Every tertön has a particular sacred site where the terma are found. Even when there are many sites, there is always a primary hub at the center. The site for Trungpa Rinpoche’s terma is a mountain called Kyere Shelkar (“White Face”), where Karma Senge Rinpoche lives. According to the address book, Guru Rinpoche visited this sacred place and blessed it; he called it Ösel Namkhe Photrang (“Palace of Luminosity Sky”). Guru Rinpoche declared that it was inseparable from other great holy sites, such as Uddiyana, Shambhala, and Five Peaked Mountain (Wu Tai Shan) in China, and that other places have great blessings of the nirmanakaya and sambhogakaya, but none have more blessings of the dharmakaya than this one. The address book says that this place holds many terma of body, speech, mind, quality, and action—each distinct from the other—and it is full of yellow scrolls, which contain terma texts in dakini script. Trungpa Rinpoche said that circumambulating this place it is like invoking Guru Rinpoche in person, that dwelling there blocks the arising of kleshas, and that practicing there will cause the realization of mahamudra to arise quickly, so that one can attain the rainbow body in this lifetime. He used to go there several times every year to do the drupchen, or elaborate group practice, of Tsasum Gongdü (“Embodiment of the Wisdom of the Three Roots”), a terma of Jamgön Kongtröl the Great. Around the age of fourteen, while going to do the drupchen, he found a treasure address of about one page. Later, at around the age of nineteen, he found a more extensive address on the full-moon day. About thirty pilgrims who were gathered there were witnesses when he brought the terma out of the side of the cliff. The terma looked like a rock made of solid stone mixed with precious stones. It was very hard, seemingly unbreakable, reddish with a design of white veins. Although it looked like a rock, it was called a “terma casket,” which was made from the bodhichitta of Guru Rinpoche and Yeshe Tsogyal. When the terma was revealed, thunder clapped, it started raining, and a pleasant fragrance came from the sky. Everyone there was amazed and started crying uncontrollably. This happened during the second Tibetan month. Since it usually does not rain in Tibet until the fourth month, this was truly amazing. During the drupchen, they put the terma casket at the center of the mandala at Kyere Monastery, the temple nearby. After seven days of practice, it opened up. Inside was a small yellow scroll, about two fingerwidths wide, which contained dakini script by Yeshe Tsogyal, which is not understandable to ordinary people. Trungpa Rinpoche and Döngyü Nyima, the eighth Khamtrül Rinpoche and abbot of Khampa-gar Monastery, transcribed the text into Tibetan letters. 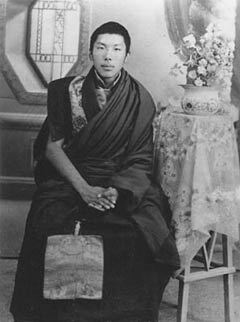 At another time, when Trungpa Rinpoche was at Kyere Shelkar practicing the drupchen, he encountered the mantra guardian Ekajati in person. She arrived in the sky from the south holding a terma casket, which she placed in front of him. The casket contained a sadhana of Ekajati and another text related to his own Tsasum Gongdü terma cycle, which includes sadhanas of the guru, yidam, dakini, and dharma protector. The first of the yellow scrolls contained prophecies about the future, a yidam practice called Künsang Chemchok Heruka, and a very profound Avalokiteshvara sadhana, which includes a method of practicing nonmeditation. I hold the empowerment and scriptural transmission of those practices. They have a very strong samaya seal, but maybe in the future I might be able to give them—if I get permission from the dakinis. At a different part of the mountain called Shinje Barwe Riwo (Mountain of Blazing Yamantaka), the Vidyadhara found another terma casket containing hairs of Yeshe Tsogyal. People say that one of the hairs is clearly marked with OM at the top, AH in the middle, and HUM at the bottom. Another terma found there was a kila of Guru Rinpoche, which is meant to be worn around the neck. Guru Rinpoche prophesied that it would be discovered in that place, three fingerwidths in length and hidden in a terma casket. Trungpa Rinpoche found the prophecy inside the terma casket and used the kila to give people empowerment. In a nearby cave, Crystal Cave of Vajrasattva, the Vidyadhara and two other lamas stayed in retreat for a month. During that time, many terma caskets appeared: some made of stone, some of copper, and some of various other materials. Inside were many yellow scrolls, which Trungpa Rinpoche kept with him. Later, he revealed that he had a full kapala of amrita substance (not the liquid) from Crystal Cave of Vajrasattva. I and others have some of that amrita. The Heart Treasure of Samantabhadra (Künsang Tukkyi Terkha). The Avalokiteshvara sadhana, The Sadhana of Nonmeditation, A Practice of No Activity,which Karma Senge Rinpoche gave the empowerments and instructions for in 2006 and 2007, was drawn from this last cycle.